Formulated with UK sourced chicken meal and fat and UK sourced free range egg. Contains omega 3 and 6 essential fatty acids and zinc to help maintain a healthy skin and coat and a full compliment of vitamins and minerals to help maintain a healthy immune system. Prebiotics may help to promote the growth of healthy gut bacteria and thus aid digestion. Formulated without wheat, wheat gluten, beef, pork, dairy and soya. Crunchy kibbles for oral health. 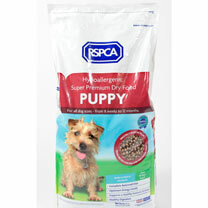 RSPCA Puppy Food is a super premium, complete food for puppies aged from 8 weeks to 12 months. A highly palatable recipe full of quality ingredients and essential vitamins and minerals. For advice on feeding and making changes to your puppy's diet click here. See below for full details and ingredients. Hypoallergenic: Ideal for dogs with skin or digestive sensitivities. No added artificial colours, flavours or preservatives. Formulated without wheat, wheat gluten, dairy, pork and soya. Skin and coat: Contains omega 3 and six essential fatty acids and zinc to help maintain a healthy skin and coat. Immune system: Contains vitamins and minerals to help maintain a healthy immune system. Healthy digestion: Contains prebiotics which may help to promote the growth of healthy gut bacteria and thus aid digestion. Also contains sugar beet pulp, which is a good source of soluble and insoluble dietary fibre, which is important for maintaining normal intestinal transit time. Teeth: Crunchy kibble to help promote healthy teeth and gums. Vitality: Our Puppy recipe is designed to give optimum energy levels and provide the required calories puppies need for healthy growth. Great taste: Contains high levels of chicken and rice to give your dog a delicious meal and firm stools. Please Note: No meat products from animals slaughtered without pre-stunning are used in our pet foods.